We are proud to anounce that Shozo Michikawa is a finalist for the Loewe Craft prize 2019. 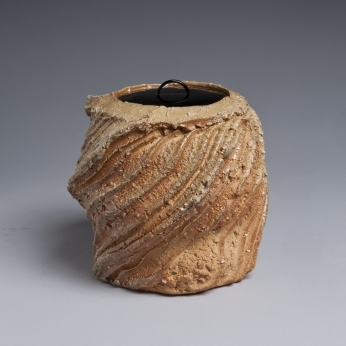 "Formed through an intensely personal relationship with his materials, and a unique process of forming clay on the potter’s wheel, this piece is a powerful example of a contemporary ceramic vessel. Rooted in tradition but with a deeply personal voice, it speaks of fundamental qualities of ceramic, displaying a variety of tones, textures and surface qualities in a cohesive dynamic form." Shozo Michikawa was born in Hokkaido, the most northern area of Japan, in 1953. After graduating from Aoyama Gakuin University in 1975, he settled in Seto, Aichi to establish his ceramic studio. His exhibitions are held widely in Japan and also internationally, such as Philippines, Mongolia, France, USA, and UK. He was a finalist in the 2019 Loewe Craft Prize. Michikawa is inspired by the power and energy of nature in its every form. He makes works that are thrown at the wheel at first and manipulated with a twist on an internal axis to transform into sculptural vessels. Firmly rooted in Japanese pottery tradition, he insists that pottery is “integral to people’s lives in Japan” and his works are respectful to this principle with a contemporary spin.